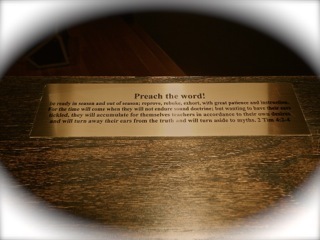 The PHILADELPHIA CHURCH pulpit was constructed in August 2013. 4 corner posts on pedestal and top: pine, colored using aniline dye and stain mixture. Pedestal base: AC grade plywood dyed and stained to match corner posts. Pedestal & top front, side & rear panels: Philippine Mahogany veneer. Pulpit top: Laminated Oak & Walnut, with Teak book ledge. I was commission by my Church to create a candle holder for the Tenebrae Service Easter, 2011. This is what I created. There is a story behind the design. I wanted to pay tribute to The Trinity: GOD The FATHER, GOD The SON, and God The HOLY SPIRIT. As you can see, the design is based on 3’s. There are 7 candles total representing the number of completion found throughout The Scriptures. There are 3 groups of candles: 1 on the left, 1 on the right, and 1 in the center. There are 3 sizes of holders on the left and on the right. There are 3 different species of wood used on the holders: Walnut, Oak, and Ash. There are 3 different species of wood used for the base: Walnut, Ash, and Oak. There are 3 components that make up the holder: the base, the candle holder, and the candle, and the riser are set 3 inches from the handles. This was my first attempt @ doing something like this. I used a dado set to cut the 4 sides of the holder and a spindle sander to achieve the curves @ the bottom. I routed the edge of the tops and just used a forstner bit to create the seat for the candle cups. This project was a lot of work, but very rewarding. The LORD was with me all the time. Thank You LORD JESUS. zeldafwilliams on DIY JOINTER? YOU BET! Kelly Craig on AWESOME SHOP SOLUTION!